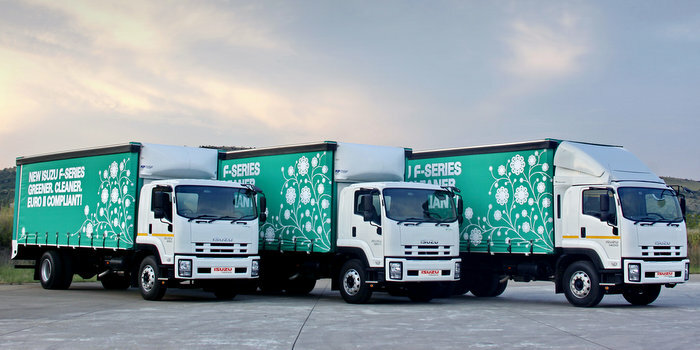 F-Series trucks hold all the aces in the heavy commercial vehicle segment providing class leading economy, safety and environmental care in a package that is tailor made to meet the demands of operators. Heavy trucks are the backbone of the economy and all F-Series trucks are engineered to give the best possible availability and economy in a safe and easy-to-operate vehicle. With nineteen models from 10 000kg to 26 000kg GVM the range is designed to provide operators with an exact match for every freight requirement. Specialist models including full-time 4X4 and 6X2 freight carriers, a 6X4 refuse compactor and truck tractors are also available. High torque turbocharged engines deliver ample power for load carrying requirements, while Isuzu’s legendary common rail diesel technology delivers unmatched fuel economy and dramatically reduced carbon emissions. Technologically advanced engine management features are perfectly complemented with rugged construction to reduce total cost-of-ownership and ensure reliability even in harsh operating conditions. Automatic Manual Transmission (AMT) is available on four models (FRR 500/FSR 800/FSR 800 Crew Cab and FTR 850) which contributes to easier, more economical operation of the trucks while increasing safety by preventing missed gear changes and allowing the driver to focus more attention on the road. Safety features include standard ABS / ASR braking systems across all models (with the exception of 4X4 derivatives), while seatbelts and door beams ensure the cab remains rigid in the event of an accident. The spacious air-conditioned cabs are fitted with a host of driver comforts to create a comfortable and productive workspace. The comprehensive range of advanced F-Series trucks provides operators with the right options to meet the most demanding requirements from freight carriers and compactors to medium haul operations and off-road application.